Not quite two years ago I first encountered the Nintendo Wii. Some of the people at work set one up in a conference room during lunch and were busy bowling and playing tennis. I was drawn to the room by the shouts of glee; it took me about 30 seconds of observation to get hooked. The Wii is quite different from any other game console. While you can sit down in front of a Sony Playstation 3 or a Microsoft Xbox for hours on end and do nothing more than move your fingers, the Wii pretty much forces you to stand up, swing your arms, twist your body, jump up and down, and do other overtly physical things to be successful. The key to the Wii’s popularity is its wireless game controller, the Wii Remote or, informally, Wiimote. These controllers have accelerometers inside that communicate with the Wii console and provide a continuous stream of data on what buttons have been pushed, how fast and in what direction the remote is moving, and the orientation of the remote. In scientific terms, the Wii Remote provides pitch, yaw and roll information, as well as velocity and vector. You can also use it as a pointer, thanks to a sensor bar positioned above or below a TV screen; the sensor detects IR (infrared) and the Nintendo Wii extrapolates these readings to show the player’s position on the TV screen. Your on-screen player, by the way, is called a Mii, and in most Wii titles, you can use your own custom-designed Mii as your alter ego. A separate controller, called a Nunchuk (a linguistic play on nunchaku, the famed Okinawan “fighting sticks” seen in so many martial arts films), attaches to the Wii Remote via a cord. It adds a trigger, a button, and a joystick in addition to an accelerometer. Using just the Wii Remote, you can go bowling, play golf, tennis and baseball with Wii Sports, which is often bundled with the Wii console. Wii Sports also includes boxing, which makes use of the Wii remote and the Nunchuk to track the movement of both hands. Wii Play, another popular title, offers billiards (pool, really), table tennis, shooting (at targets), a tank battle, cow racing (don’t laugh; it is intense) and two games that I won’t even attempt to explain. All these games use the Wii Remote. Aside from the fact that the Wii is not for couch potatoes, it is hard not to notice the elegance of the Wii human-computer interface. The Wii Remote has a speaker, and the remote beeps, buzzes, whistles and chirps in response to the user’s actions; you can silence the remote, but why? If you “hit” something with the Wii Remote, it vibrates. After getting over the initial shock, the user feedback seems very natural, consistent and appropriate. If you have multiple Wii Remotes (and a Wii isn’t nearly as much fun without a small crowd), you pair the remotes with the console, and lights on each remote remind you that you are player 1, 2, 3 or 4. The console knows the difference, and won’t let player 1 use player 2’s remote. Visual indicators on the TV screen also remind you, making multi-player interactions smooth and intuitive. The games and other activities (there are many things you can do with a Wii that aren’t in the least game-like) take good advantage of the controls. In Dance Dance Revolution: Hottest Party, the Wii uses music and visual prompts to guide you through dance steps; a special floor mat tracks the position of your feet, and you are graded on your timing, accuracy, and finesse. In contrast, Endless Ocean is not so much a game as an extended lesson in marine biology as you “dive” and swim along in scuba gear, finding various kinds of marine life and discovering facts about the ocean. It is stunningly beautiful, but you don’t get wet or seasick. In May, Wii Fit reached the United States after achieving best-selling status in Japan. Using a special wireless Wii Balance Board, Wii Fit guides you through over forty different training activities involving yoga, strength training, aerobic exercise and balance games. 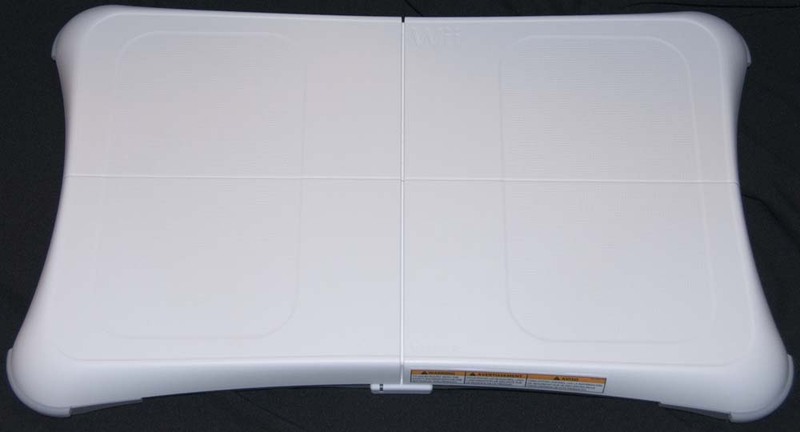 The Wii Balance Board, which looks like an oversized bathroom scale but without any dials, measures your weight and weight distribution as you engage in a wide variety of exercises. Many exercises also use the Wii Remote and Nunchuk, either alone or with the Wii Balance Board, and all these instruments gather a huge amount of information about your physical movements. From this, Wii Fit tracks your weight, calorie expenditure, and “Wii Fit Age” on a calendar, complete with graphs showing your progress. All the data is stored on the Wii’s hard drive (and you can password protect your embarrassing personal information). It is all pleasingly integrated; even fussy Mac owners should be impressed. Recently Nintendo released Mariokart Wii. As the name suggests, Mariokart features many of the characters from various Nintendo games of the past couple decades, including Mario, the mustachioed hero of Super Mario. But this has almost nothing to do with Mariokart. Simply put, Mariokart is about racing. You pick your driver, from one of a collection of Nintendo cartoon characters (or your Mii), and select a style of motorcycle or racecar. You pick a racecourse. And you race. 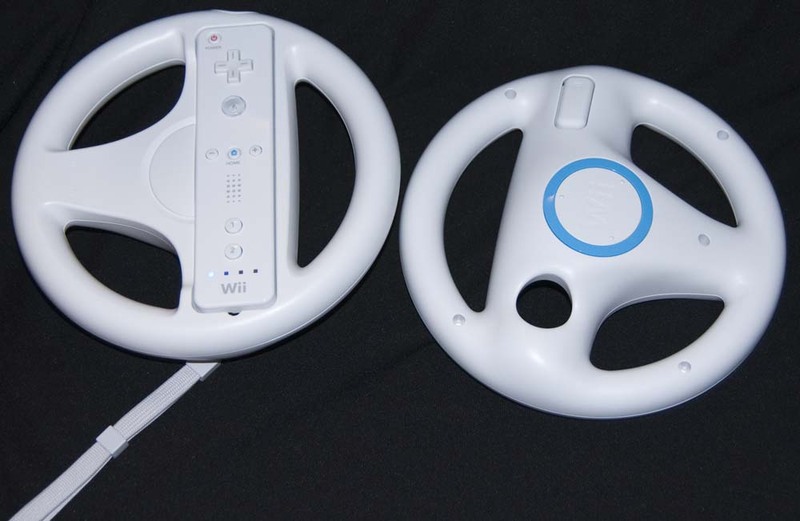 Wii has a special steering wheel, the Wii Wheel, in which you fit the Wii Remote, and you use buttons on the remote for braking, acceleration, and other actions. After a slow, exasperating commute home from work, nothing picks you up quite as much as racing around on ice floes dodging penguins or racing through mines or racing through, in one course, a shopping mall. Mariokart would be exceptional just on its own, but there is one feature of the Wii that hasn’t been mentioned yet: it has WiFi. And if you have broadband Internet access in your home, and a wireless router, you can race against other people – in other countries. Curious to see how this works, my spouse and I called our daughter, currently doing graduate work in England. Coordinating our activities using Skype (an Internet video telephone service, similar in function to Apple’s iChat), we managed to get two Wii consoles talking to one another across 3,500-something miles of ocean. We then matched up four Wii Remotes and four Wii Wheels, two sets in the U.S. and two in England, and then my daughter, her fiancé, my spouse and I raced. With audio and video exchanged by Skype and two Mac laptops, it was exciting, it was hilarious, and it was also very Mac-like. It “just worked.” We couldn’t help but notice that our daughter’s fiancé, who has only had a driver’s license for a few months, managed to win more races than the rest of us combined. Since the Wii has WiFi, it seems only fitting that you can use it as an Internet device. You can get weather forecasts and read news stories. You can send and receive E-mail (E-mail arrives on-screen in envelopes, which is a nice touch), including E-mailing other Wiis. Nintendo recently added a “channel” for polls, and you can participate in polls covering politics, pet names, phobias and other subjects that don’t start with “p.” Some of these tasks are easier to do on a Mac, that is true, but the polling mechanism, in particular, is a masterpiece in interactive design. Washington Apple Pi is an international user group, with a history spanning three decades to the dawn of personal computing. The “Pi” continues to serve users of the very first personal computers as well as users of the most modern, advanced systems through its meetings, magazine, computer bulletin board and Internet services.